Summer Sale, Current Projects and New Pics. Also you are invited to take 10% off all items in stock at my booth 2R09 at the Fleetwood Antique Mall in Fleetwood, PA I will keep this sale on through July 4th for sure. Please note Mall hours are 10-6 Wed-Fri with SPECIAL HOURS during the Kutztown Folk Festival! They will be open Monday and Tuesday that week, July 6th and 7th! The Mall has also combined forces with Berks County icon GRQ Used Furnishings so you definitely want to pop by the mall and have a look! Great eclectic shop with items from all eras, unusual finds and so much more. I really love my mall so come take a look. Don't forget, if you are close enough to visit the mall, I can have ANY of my online inventory there for you to pick up! All you have to do is give me a few days notice and I will take what you want to see out for you! My space is not that large, but I will do my best to accommodate! DINING SET- new pics, seats redone! The Drexel set I have is all cleaned, touched up, new black sueded fabric on the seats and ready to deliver. It really is beautiful! Sad that I do not have the 4th chair, but knowing this seats 10 anyway, you can totally add a set of different chairs to pull off the look and I suggest something totally different like a set of Bertoia wire chairs. I am sure if you continue to look a matching set will pop up but in the mean time, the mix up look is pretty hot right now and you can use that to your advantage! If you know anyone searching for a set, please send them my way! I have this priced very low under market value and would love to find it a great home. etsy listing for pick up/delivery (REGIONAL buyers) please, Chairish.com/shop/madmodworldvintage for white glove shipping. My chairish listing will probably be live in the next day or 2. Many touch ups, lacquer applied and new seat covers in sueded charcoal have been added. Such a great set! I am in the process of sanding my first 2 tables of 6. My stains are here and this will be the first time I am trying the wheat finish so am looking forward to that. 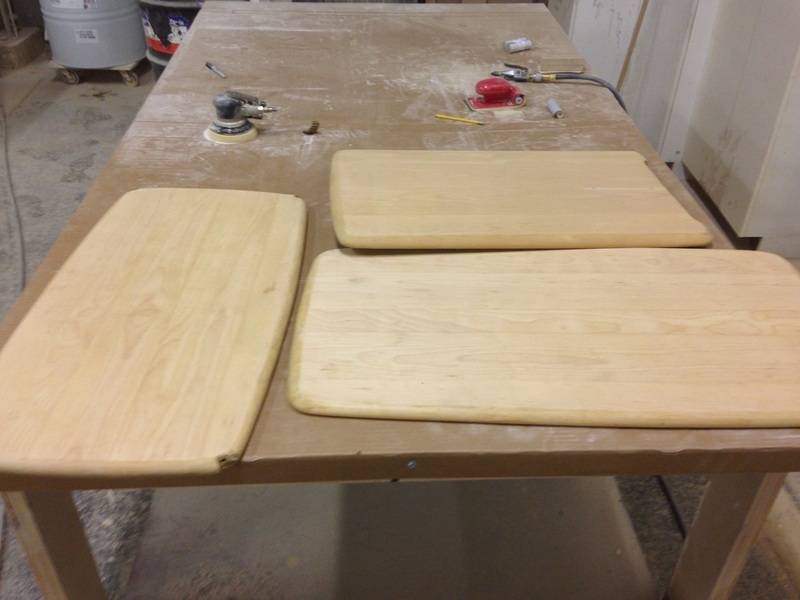 I have a lot of hand sanding left, but spent some time after work today using a sander on the larger flat table tops. Plus I got some tips from my boss and coworker. The beautiful tiered cocktail table is reserved and going to be refinished in wheat. I will also do one pair of the floating top step end tables in wheat and they are up for grabs. I will then do the 2nd pair of step end tables in champagne. The corner table could go with either set so will do that one last to match either stain. I am excited to make these pretty again! Of all of the things I find, restore and find homes for, Heywood is what I choose to keep in my home and that is why I choose to save it. If you search back through my blog posts, you can find some recapping my Heywood restorations. It is probably about a year old now! It is amazing how many projects come and go in a year! Click on the PAST SAVES tab to see pics and info from some of my prior Heywood Wakefield restorations. Pole lamp is serviced, brass polished and it is ready to use! My husband got to go over the pole lamp and it is ready to use. A word of safety advice on these things. Both pole lamps had wiring issues. You will not find them unless you take apart the pole and inspect. My husband has test sets to check for shorts, etc. Any loose fixtures were tightened. I still would not leave any vintage light on unattended. Please note with this light there is damage from a hot bulb on the gold shade. Using LED bulbs can help prevent that in the future, but once again, keep a check on your vintage lamps so that you know they aren't getting too hot for the shades. It is a real shame to find damaged items and surely you will not want to be responsible for that. Many people used bulbs with too high a wattage, but in general, a light bulb gives off a lot of heat. Be smart and stay safe! I just shipped out the adorable blonde record cabinet! That beauty had some of the most views of anything I have ever listed on etsy! Glad she finally got herself a home! So many more awesome items are available! I know I have been sourcing some higher end items lately and I do love being able to bring those things to my shop, but I am aware that they are not for everyone. Thanks for following along in my adventures and please share my info with folks you may know in the design field, mcm enthusiasts and people looking to redecorate. I appreciate the support and referrals!